Last night the Powerball lottery had a record jackpot. This really brings out the stupid in America. "I normally don't waste my time with this, but when the jackpot is over $100 million then I play." Right, because $99,000,000.00 is really not worth all that effort it takes to buy a ticket. "I didn't when the jackpot, but I won $10!" Sure you "won" ten dollars, but you spent twenty playing the game. But the ten dollars you actually lost doesn't count in their mind, because that was "an investment." "Sure I not likely to win, but some has to win it! You never know." Someone will win it, and it won't be you. You have a better chance of being stuck by lightening SIX TIMES AND LIVING that winning a lottery jackpot. The saddest part is, the people who throw their money away on the lottery saying "someone has to win" or "you never know", are the same people who won't invest in stocks or mutual funds because they are "too risky." They see something that has maintained an average 12% yearly gain over the last eighty years as too risky, but they'll buy tickets for a chance at a jackpot, when they more likely to be stuck by lightening six different times and live, than the win that jackpot. Someone has to win, and it won't be you. Let's put some numbers to it. Let's say have an extra dollar each week and you have two options on how to use that dollar. One: you can add it to a mutual fund. Two; you can buy a Powerball ticket. 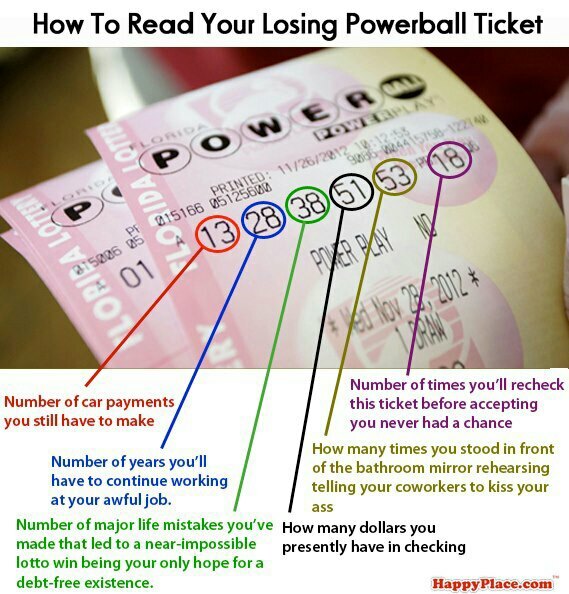 If you bought Powerball tickets, at the end of the year you have on average about zero dollars. If you put the money into a mutual fund, at the end of the year you have on average about $58.24. The old line of "the rich get richer, while the poor stay poor" is very true. One of the reasons is the rich aren't stupid enough to waste their money on the lottery. But hey; "some has to win it! You never know."